Members of the political family of Asiwaju Bola Tinubu have threatened to vote against his choice, should he back the Lagos State Governor, Mr. Akinwunmi Ambode, for a second term. The decision followed pressures being mounted on the National Leader of the All Progressives Congress (APC), Tinubu, from different quarters to back Ambode for second term. 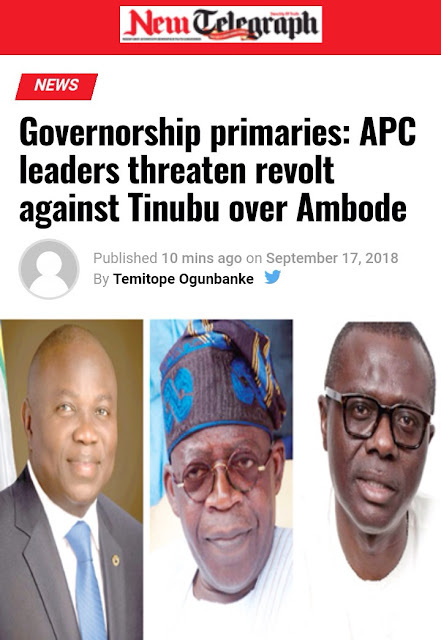 New Telegraph gathered from a reliable source in the party that Tinubu’s loyalists, who are majorly in Mandate Movement, held a meeting in Lagos yesterday and unanimously decided to challenge their leader if he backpedals to support Ambode. Tinubu is believed to be backing the Managing Director of Lagos State Property Development Corporation (LSPDC), Mr. Babajide Sanwo-Olu. The supporters of the APC national leader are mobilising for Sanwo-Olu to emerge as APC governorship candidate during the party’s primary election on September 25. According to the source, Tinubu’s loyalists said they were dissatisfied with the way they were treated by the governor despite supporting him at the expense of other aspirants during the 2015 elections. They, therefore, said that they were now solidly behind Sanwo-Olu. “We have gone far in our support for Sanwo- Olu and at present, it will be difficult for us to back out from our desire to stop Ambode’s re-election. “In fact, some of the party leaders resolved at the meeting that they are ready to challenge Tinubu for the first time since 1999 if he decides to support Ambode’s re-election. They said they would embark on protest votes if Tinubu asks Sanwo-Olu to withdraw from the governorship race. “The present situation has nothing to do with Tinubu alone; it is about key leaders of the APC, who are not happy about how they were treated by the governor. They worked hard for Ambode, but despite their support for the governor, he abandoned them and treated them badly. The party leaders resolved at the meeting that if Tinubu supports Ambode, they would embark on protest votes against him,” he said. New Telegraph learnt that Ambode met with Tinubu in Abuja on Friday for five hours where the governor made efforts to appease the APC National Leader. Sources told our correspondent that after the meeting, Tinubu softened his hard stance against the governor, but without concrete support on his reelection bid. Tinubu reportedly told Ambode that the final decision is with the party leaders. Consequently, the former governor asked Ambode to go and dialogue with the party leaders in the state. “There was no concrete commitment after the meeting. For five hours, Ambode tried hard to sort out his disagreement with his political benefactor. The governor was told to go and appease the Lagos APC leaders. “We are hopeful that the issues would be resolved, probably after the Osun governorship election holding this Saturday,” the source told New Telegraph. Meanwhile, in what seems to be a test of might, top APC leaders, members of National and State Assemblies, council chairmen and thousands of APC members and supporters yesterday shunned the heavy rain and trooped out to attend Sanwo-Olu’s formal declaration to vie for the Lagos State governorship ticket of the party. Among prominent personalities at the declaration held at City Hall, Lagos Island, were Lagos APC deputy chairman, Chief Sunday Ajose; Senator Gbenga Ashafa, representing Lagos East Senatorial District; members of House of Representatives, Hon. James Faleke and Hon. Rotimi Agunsoye; former Lagos APC deputy chairman, Cardinal James Odunmbaku; former Minister of State for Defence, Chief Demola Seriki; APC Vice Chairman (Lagos- East), Chief Kaoli Olusanya; Director-General of Babajide Olusola Sanwo-Olu Campaign Organisation, Mr. Tayo Ayinde; former Commissioner for Finance, Mr. Wale Edun and Chairman of Conference 57, Hon. Omolola Essien, among others. Speaking during the declaration, Sanwo-Olu promised the party leaders and the electorate that he would run an all-inclusive government if voted as next governor of Lagos. Sanwo-Olu, who paid tributes to all the former governors in Lagos State, was silent about Ambode, without crediting anything to him like he did for his predecessors. He called on party members and Lagos citizens to join him to elevate the state in all facets of human endeavour through improvements, enlightenment and development by voting for him at the forthcoming governorship primaries and next year’s gubernatorial elections. Sanwo-Olu, who said he has garnered a lot of experience, having served in the cabinets of three governors from 1999 till date, also promised to restore the lost glory of Lagos State. His words: “The APC has been established as a grassroots party of the workers, artisans, middle class professionals and all those who desire the progressive development of Nigeria. The manifesto of our party promises welfarist programmes and building the capacity of our economy so that we can provide jobs for the youth and make our country stable and secure. He stressed further that: “Our government’s focal point shall be to provide the greatest good for the greatest number of the people of Lagos State. “I have invited you here today to join me in the journey to take Lagos State to a new dimension by transforming the manifesto of our party to the programme of action. I am sending a clarion call to our party members, men and women, youths and the elderly, that there is a lot of work to be done to achieve the Lagos of our dreams. “I present myself as a capable, competent and tested hand to make Lagos greater. I declare that I, Babajide Olusola Sanwo-Olu shall be a true party man in the real definition of the word by running an inclusive government according to the ideology of the APC and the long-term benefits of the great citizens of Lagos State. Loyalty is the currency of politics. I shall be loyal to the people of Lagos State, the organs and the leadership of the party.” Also speaking at the declaration, Seriki called on party members to vote massively for Sanwo-Olu during the forthcoming APC governorship primary election. He also urged party members and his loyalists not to rest on their oars. The former minister implored them to start campaigning vigorously for Sanwo-Olu to win the 2019 governorship election. He said this is the first time that someone from Lagos Island is being positioned for Lagos State governorship and, therefore, demanded massive support for Sanwo-Olu.